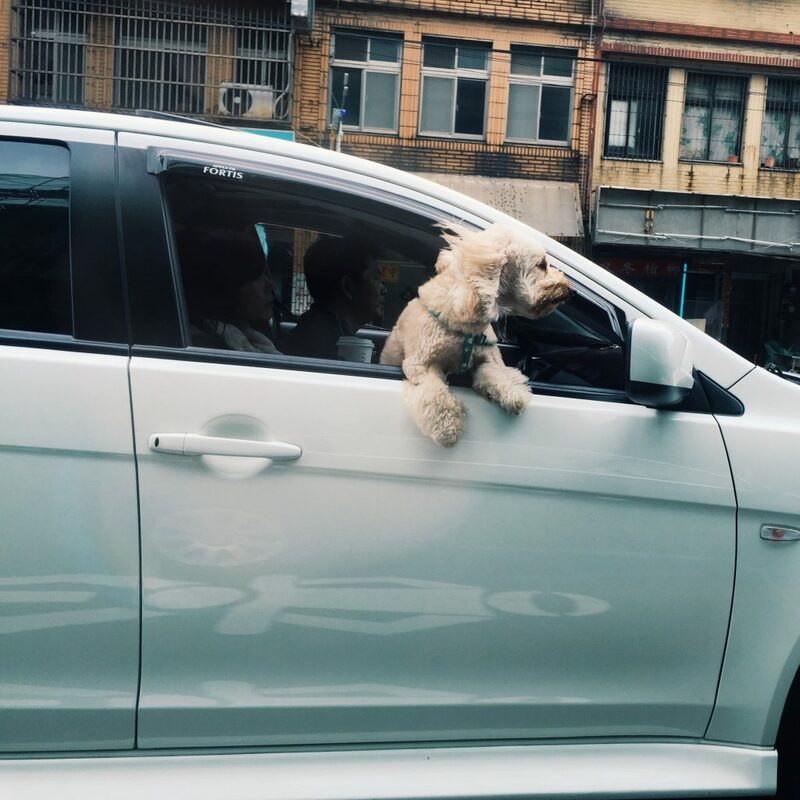 When we look at the world around us we see simple systems, the water ripples in the bathtub or a dog’s ears flapping as they hang out of the window of a moving car. We learn these effects as children and hardly notice them as we grow older. Behind these everyday occurrences lie an incredibly complex system of cause and effect that even today with supercomputers the size of football fields, we cannot simulate with 100% accuracy. 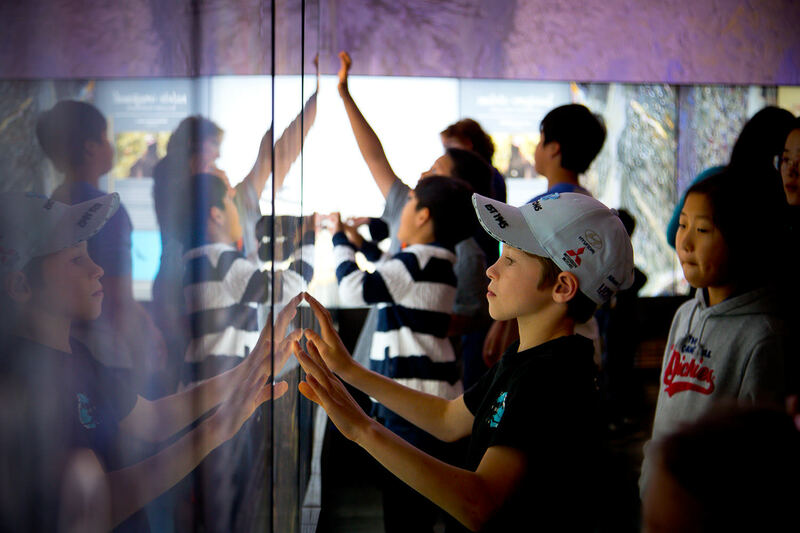 QUT’s Winter holiday program saw The Cube come alive with over 3,700 budding geologists, nature explorers, and aspiring artists. 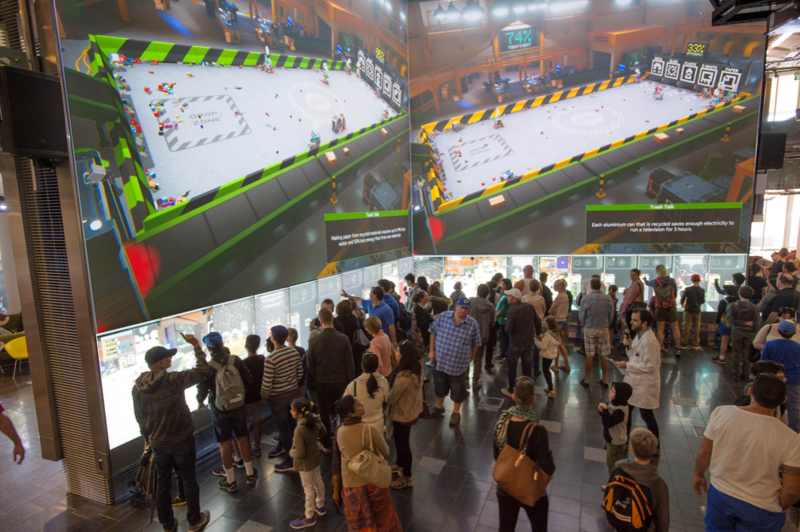 The holiday program, inspired by The Cube’s new project Nature imagined, offered a range of activities for visitors to explore and interact with science, art, and nature. A guided tour of Nature imagined kicked off the first day of the program. Led by artist Maureen Hansen, visitors were led on a journey of discovery from The Cube to The William Robinson Gallery. Maureen highlighted inside information on the artworks gained through her time as a student of Robinson’s. She demonstrated his brush mark techniques by zooming into the detail on The Cube screens and pointed out the distinctive use of colour in the original paintings displayed at the William Robinson Gallery. 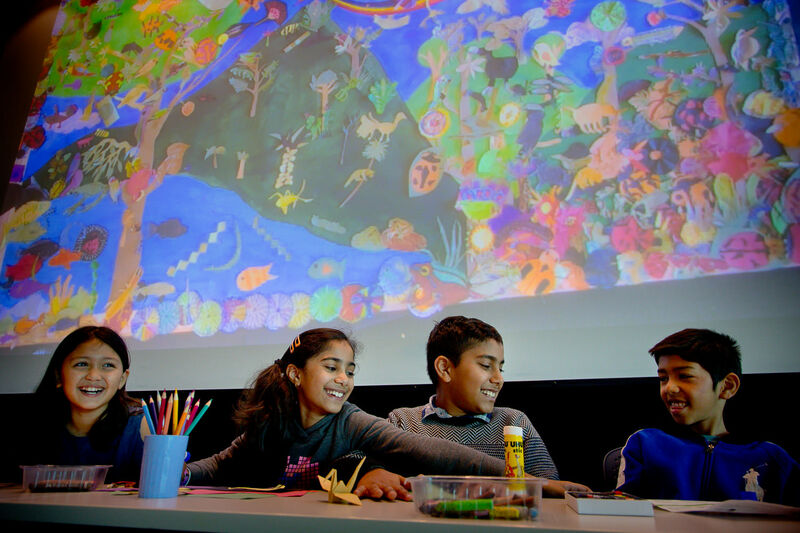 In the Micro Macro sessions, children made their own artworks using source images of plants, animals, and even microbes drawn from the Springbrook region. We were impressed by the wonderful variety of creative responses – from ladybugs, to frogs, birds, and even butterflies! The huge evolving collage was curated by resident artist, Jacqui Smith, from the Scale Free Network. She orchestrated all the elements (and kept chaos at bay!) by adding individual artworks to the collage which was also captured in the time-lapse video recording. Micro Macro. Photo by Patrick Hamilton. Each morning of the holiday program, an excited group arrived to take part in the Become a budding geologist workshop. Kasia and Adam, QUT Extreme Science Van ambassadors and real geological researchers, lead a group of 8-15 year olds and uncovered the mysterious world of minerals. Over 240 visitors booked into the workshops and the children were amazed to see the colourful rock samples through the high-tech polarizing microscopes and were keen to learn about the techniques used by geologists to identify rocks. Become a budding geologist workshop. Photo by Patrick Hamilton. QUT’s Science and Engineering Faculty lent us their augmented reality sandpit and it proved to be a real hit with children! With hand-sanitiser at the ready, visitors were able to shape mountains and valleys generating new topographic projections and even created virtual rain. To complete the digital scavenger hunt, visitors borrowed iPads and collected fun facts about insects, animals, and plants. These super sleuths did a great job and even had to peek under The Cube stairs to complete some of the scavenger hunt missions. Beanbags, books, and puzzles were the order of the day for those wanting to read and relax. Thank you to all the enthusiastic art and nature explorers who came along to QUT Winter holiday program! Nature imagined is now in rotation on The Cube screens and the exhibition at the William Robinson Gallery remains open until June 2019. The Cube‘s Nature imagined project displays three of William Robinson‘s captivating landscape paintings, digitised for the first time at high resolution. Visitors can zoom in on each of the artworks to see intricate detail and discover fascinating facts about the painted landscapes. This project brings together the interaction of classic visual art and science, providing an opportunity to learn about the flora and fauna of the Springbrook area that William Robinson paints and gain insights into the artist’s techniques. 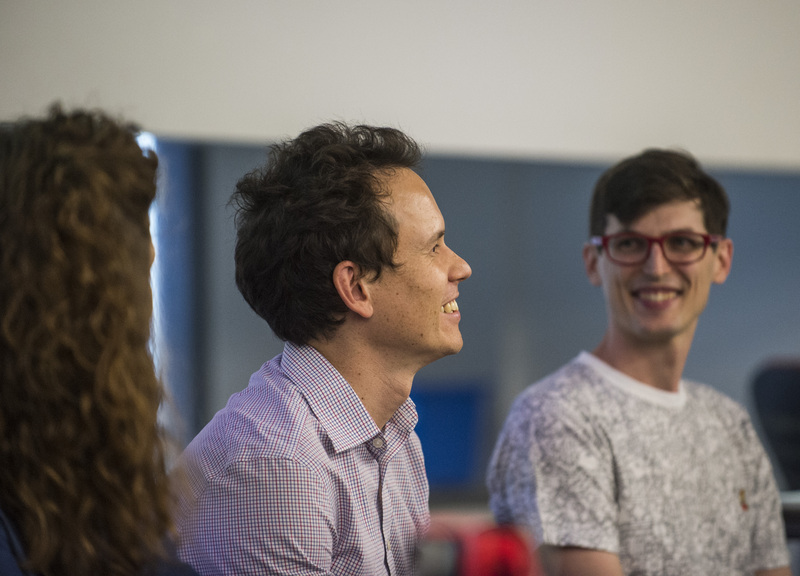 We checked in with developers at The Cube to find out what it takes to bring a massive project like this together and what aspects were the most exciting to create. The Cube’s Nature Imagined allows visitors to interact with the works. They can learn about the flora and fauna of the Springbrook area and gain insights into the artist’s techniques. What process was used to collect this detailed information? We travelled to Springbrook multiple times to photograph and film the plants and animals that inspired William Robinson to paint the area. 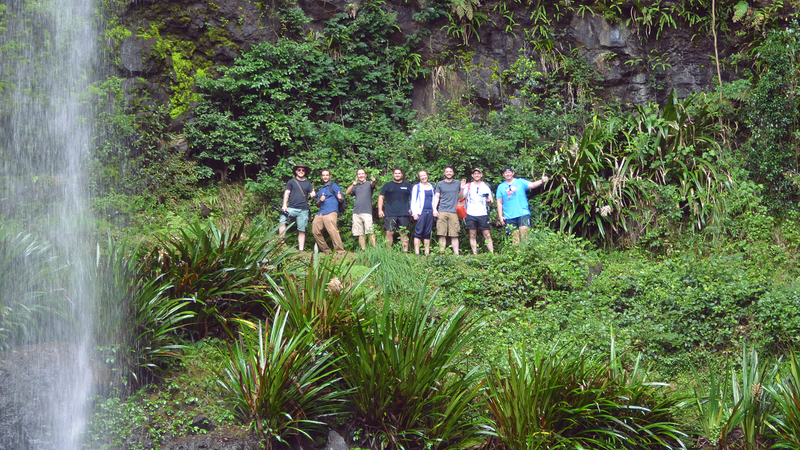 We worked closely with experts here at QUT to ensure all the information was accurate, we are lucky to be surrounded by incredibly knowledgeable educators which is a big help when working on projects like Nature imagined. We primarily filmed the video clips that are used in Nature imagined information panels. These clips are specially edited to appear endless, we used the latest video editing techniques to give the illusion of perpetual motion wherever possible to try and illustrate the constant, moving beauty of nature. Cube Studio team at Springbrook, 2017. This project is an interesting change for The Cube as previous projects have been based on science. How have you adapted The Cube’s technology to showcase a project of fine art paintings? We have had to write special software to enable The Cube to display such high-resolution images. This software has enabled us to generate very smooth movement of these large images, and what we have managed to achieve is incredible considering how much data is being moved around. New code to handle the image zooming and scrolling was created as we wanted to match the public expectations of smooth interaction experienced on our smartphones and tablets. Working on a project like Nature imagined has been a nice break from the hard science we usually deal with such as robotics or the periodic table. We created an ambient soundtrack of birds and running water that plays in The Cube when the project is running, we have had that soundtrack playing in The Cube Studio for a few weeks now, it is very relaxing! You mention the team developed new software to enable The Cube to display high-resolution images. Can you tell us about this new software and existing software, Unity 3D? How do these software packages complement each other? We use the game development software Unity 3D to create all of our projects. It’s fantastic for most applications, although we are pushing the limits with William Robinson’s super high-resolution paintings. Some of the challenges during the development of Nature imagined were ensuring the first touch and subsequent manipulation of the paintings felt natural. We also had to master seamlessly looping the videos we shot while on location in Springbrook, to give the illusion of perpetual motion, they are quite hypnotic! Can you explain some of the challenges in developing a project like Nature imagined? And how were these problems different to recent projects like Code-A-Bot? Our approach to any project is similar; we design from a user’s perspective. The team will define what a visitor would like to learn or how someone new to The Cube may experience the project, then break down that experience into smaller parts that we can work on. Nature imagined contains a lot more information than Code-A-Bot, our previous project. It is always challenging to manage research and expertise from QUT stakeholders and Nature imagined was no exception. Our subject matter experts ensured we had enough information – sometimes too much! This information had to be entered into the project and proof read – quite a task! A big paper trail but it is safe to say the research is all in and it gives Nature imagined depth and longevity. In what other ways can visitors understand and interpret the ideas in Nature imagined? 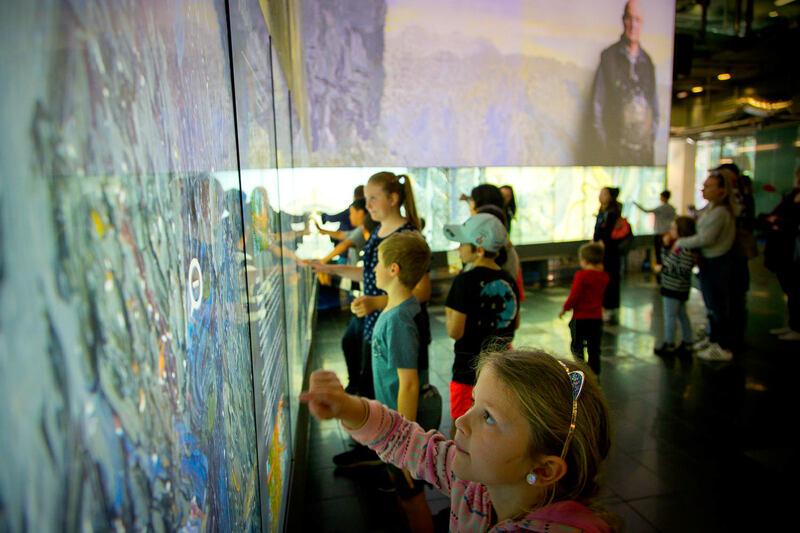 The Cube’s Winter holiday program (7-14 July 2018) features a wide variety of drop-in and bookable activities to delve deeper into the themes of Nature imagined. As well as being able to interact with The Cube screens (Nature imagined, Dino Zoo, Retro Arcade) families can get hands-on with art and natural sciences. Visitors can drop-in to Micro Macro and make drawings from flora and flora of the area and then add to an evolving collage. 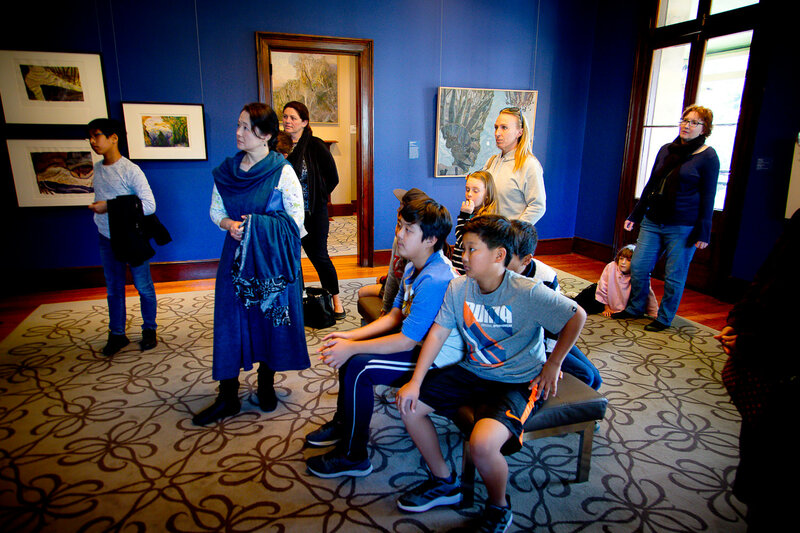 The digital scavenger hunt allows families to work together to look for insects and plants displayed at The Cube and follow missions over to the William Robinson Gallery, located within Old Government House. 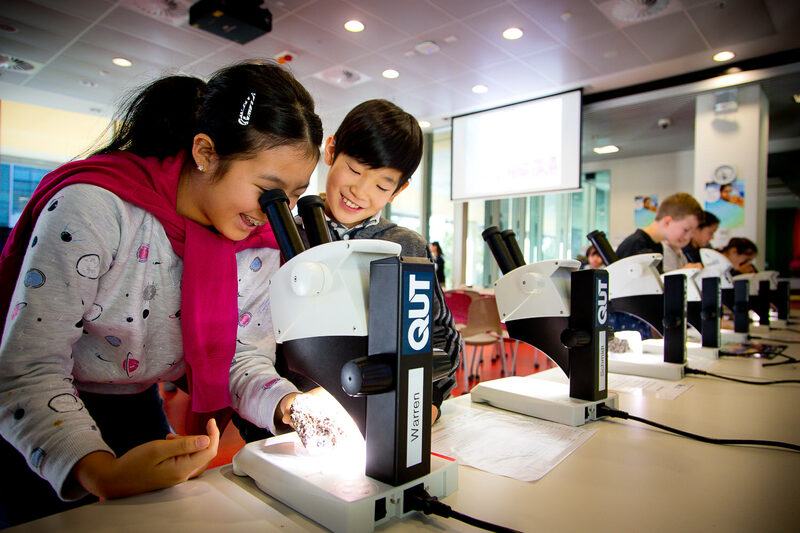 Families can meet QUT scientists working on real-world problems and explore a variety of rocks on display. 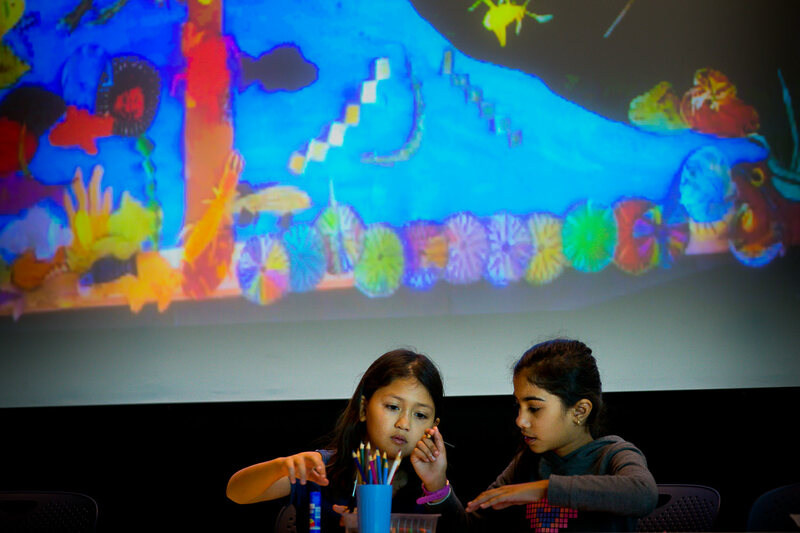 Kids are encouraged to observe and interact – an important skill for aspiring artists or scientists. 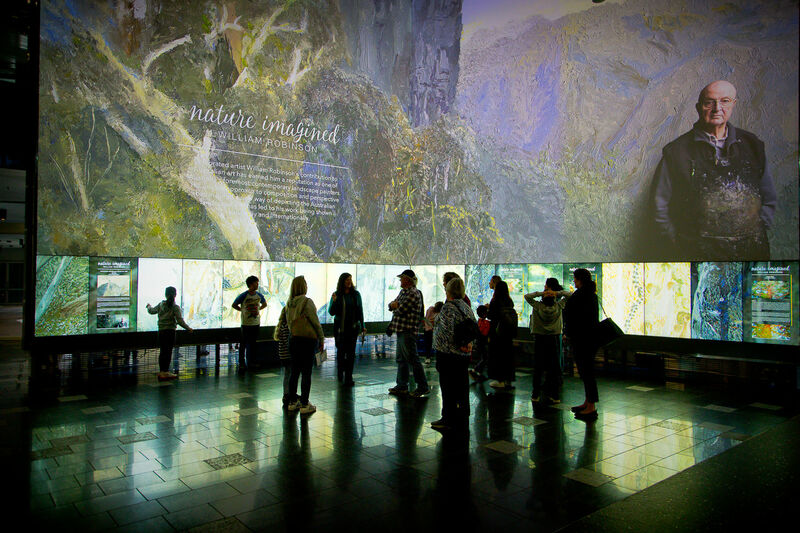 Nature imagined is an exciting new collaboration and will be displayed in two mediums: in the William Robinson Gallery and digitally on The Cube. This unique interaction of art and science provides an inspiring and explorative digital experience and this week we talk to Vanessa Van Ooyen, Senior Curator of the William Robinson Gallery, and Simon Harrison, The Cube Studio Manager about the development of Nature imagined. Vanessa: The William Robinson Gallery and The Cube are two very different venues to showcase William Robinson’s work, how did the idea for Nature imagined come about? And can you tell us how Robinson’s knowledge of the works has informed the project? If you have visited QUT Art Museum during the Draw It. Code It. 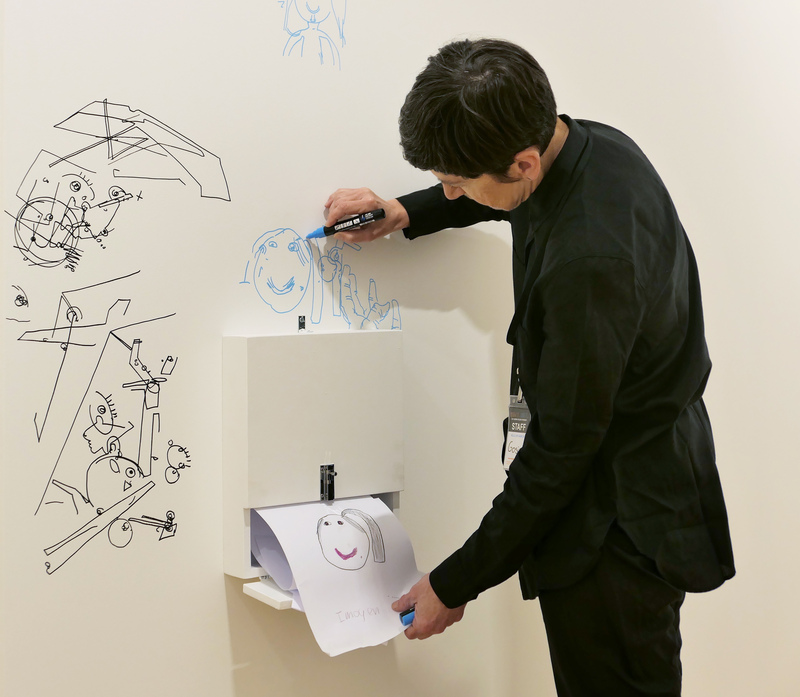 QUT Summer Holiday Program, you will have seen drawing artist Gosia Wlodarczak (pronounced “Vwodarchak”) hard at work drawing faces inside a closed, custom-built room. We thought we would shed some light on Gosia’s installation in order to demystify her work and inspire you to submit your own self-portrait to the artist! Finding maths in movies – you just need to know where to look!